Discover our Compelling New Release! To feed his family in North Korea, Dae Sung Kim illegally traded goods across the border with China, and was put on a government watch list. To save himself, he had to flee south. Life in South Korea was much different. In North Korea, there were times he went without food for a whole week and his only dream was to eat a stomach-full. In South Korea, he found plentiful food and a place where people had bigger dreams. Dae Sung Kim became a venture capitalist for other North Korean refugees, helping them start businesses and transform their dreams into reality. Learn how Korea became two very different countries divided by the 38th Parallel. 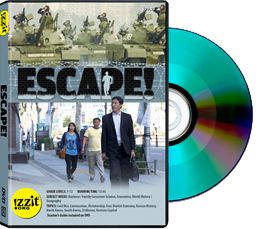 Hear Kim's story of Escape! from North Korea, and how he hopes to one day return to his former homeland. For more information, go to http://www.izzit.org/home_offers/escape/index.php.